There are often times that I want to play something straight forward and without overly complicated mechanics, it’s at this point I usually fire up AudioSurf. Despite being over 4 years old the game still feels unique and high quality, plus it’s an awesome way to expand the enjoyment of your music in a unique way. There are 3 levels of play and within each of those levels are 14 of game types, each is unique and has it’s own benefits and pitfalls. 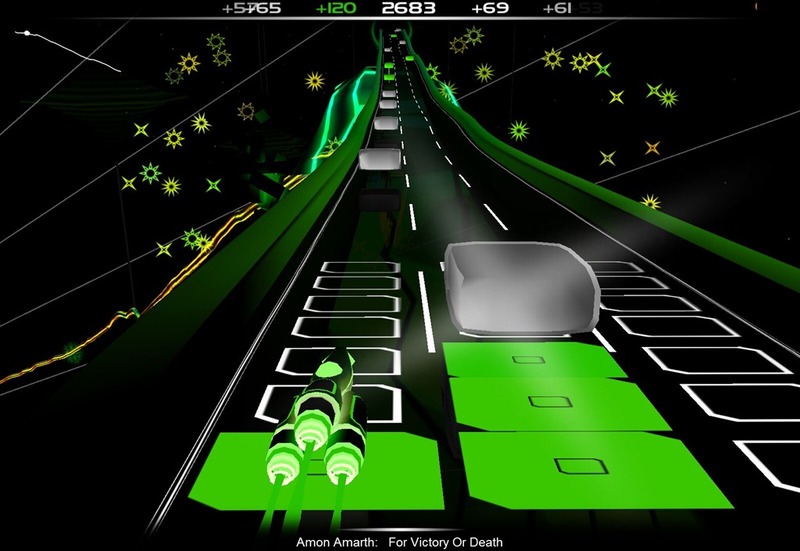 Despite playing the same style of track then difference between the game types is one of the reasons the game remains exciting and enjoyable. As well as playing DRM-free music on your machine you can play songs from AudioSurf radio or you can opt to play a track from the Orange Box soundtrack which covers the music from the Value games Half-Life 2: Episode One, Half-Life 2: Episode Two, Portal and Team Fortress 2. A sequel called AudioSurf Air was announce earlier this year, the visuals look good but may indicate the game is moving to an even more Wipeout style track. I hope that the core game elements remain the same otherwise I’ll just have to keep booting up the older version forever more. If you haven’t played it you can find in on Steam for £5.99 at the moment, but it does normally make an appearing in the Steam sales.